Today I'm teaming up with some of my blogger friends to share various ways to style wedge booties during the winter season! The booties we are wearing are the Secret Celebrity's Keyport Wedge Bootie from Camtrade Footwear. They are stylish, comfy, and so versatile! For my first look, I paired my wedge booties with a sweater dress and opaque tights. I love this printed sweater dress from Express! 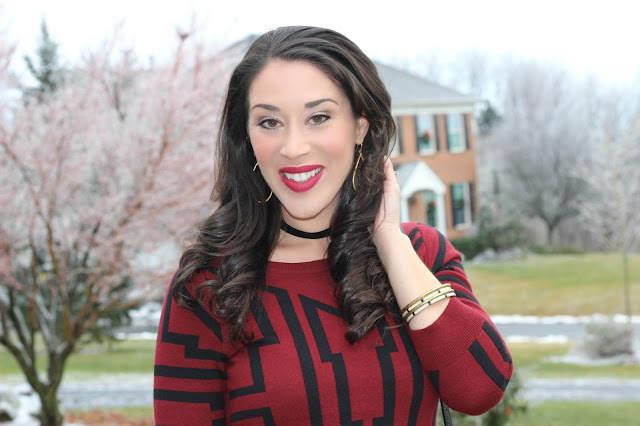 The deep red color is gorgeous for the holidays and the black geometric print is unique and super fun! This dress runs true to size and is marked down to $34.95 right now (50% off)! 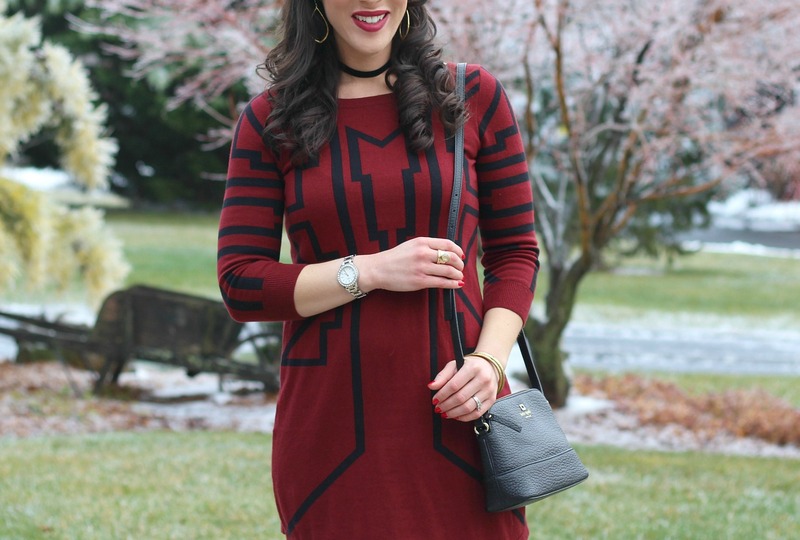 I chose opaque black tights to wear with this sweater dress. I'm a huge fan of Hue tights... I'm wearing the Hue Absolute Opaque Tights from Macy's. They work perfectly with wedge booties and are great to wear with pumps, too. These Camtrade wedge booties are my new favorite black bootie (they also come in gray)! I love a good wedge because they are comfortable to walk in while providing some height! These are no exception. They are comfy and chic and I love the buckle detail. You can shop these booties on Amazon and at Camtrade Footwear. For accessories, I wore my BP. black velvet choker, gold hoops, and my favorite bangles from Hazel & Deene. If you're looking for a simple choker, I recommend this BP. choker from Nordstrom. It comes in a few colors and is only $14. My hoops are from Silpada and they are my 'go to' earrings. Nordstrom has a similar, very affordable hoop earring that I also really like. For my second look, I styled my wedge booties with gray jeans and a tunic sweater. This is the perfect casual winter outfit and so easy to recreate. 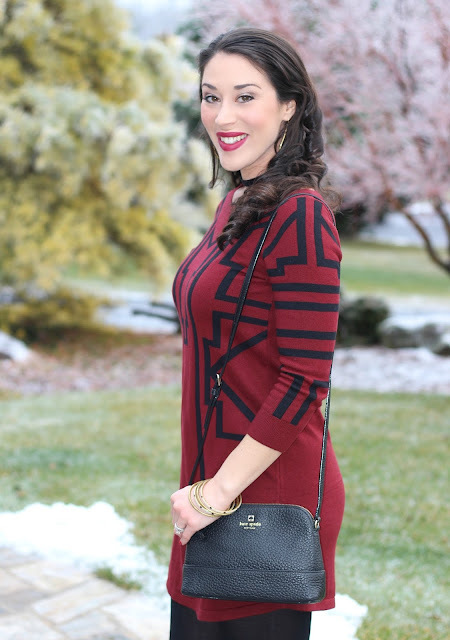 I purchased this Caslon Zip Back High/Low Tunic Sweater at the Nordstrom holiday shopping party. 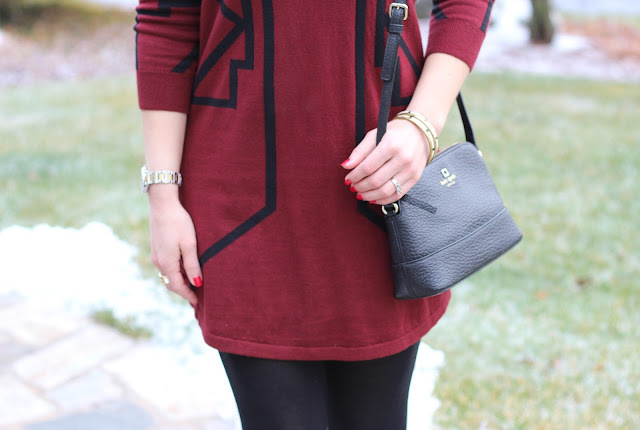 It's a simple sweater, but I love the tunic and high/low style! It's on sale for $39.90 and comes in several colors and stripes. Since these wedge booties aren't super low, I had to cuff the bottoms of my jeans. Ankle jeans work best with booties like these. These Ralph Lauren legging jeans were a great find at T.J.Maxx! For a similar pair, I like the Caslon Stretch Skinny Jeans at Nordstrom. 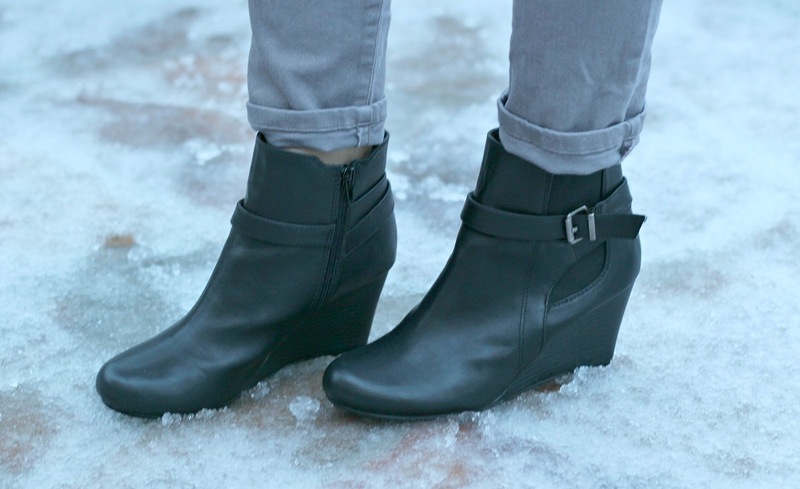 As you can see, these Camtrade booties look great with jeans as well as leggings! *Product was provided, all opinions are my own. Love both looks and the color combos. It looks so cold outside but you look gorgeous and warm. Adorable. I love the grey with the blue. Pinning this look for later. I LOVE that sweater dress!! There you go with that color again, STUNNING! And those booties are great, they could go with SO much!! I love it withe the dress and tights! Black looks great too! Looking great Tamara. I love that sweater dress especially. These are nidce get-together family Christmas looks. Both of these looks are beautiful! I am especially partial to the red dress, beautiful! !